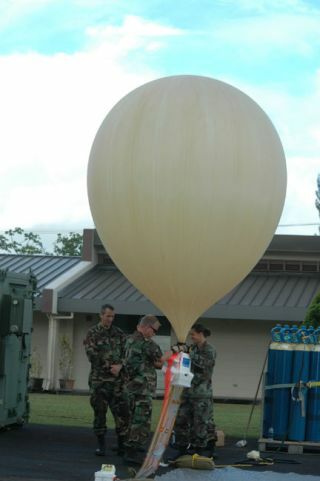 Air National Guardsmen attach the payload and prepare to release a nearspace high altitude balloon in Hawaii. BOSTON -- Arecent U.S. Defense Department exercise has helped increase awareness in themilitary about the value of using high-altitude balloons operating near theedge of space to set up emergency communications networks on short notice,according to an Air National Guard official. Theballoons played a significant role in the exercise, which featured a scenarioin which Air National Guard units respondedto a fictional earthquake in Hilo, Hawaii, from June 18 to 20, according toLt. Col. Patty Tuttle, commander of the Arizona Air National Guard?s SecondDetachment. Theexercise was part of the California Air National Guard?s regular training, butthe Arizona unit, which is dedicated to operating high-altitude platforms, wasbrought in to supply communications in the initial phases of the scenario, inwhich the earthquake wiped out existing communications infrastructure, Tuttlesaid in a July 10 interview. Tuttle?sunit is the only military organization today that is trained and equipped tooperate the high-altitude platforms, and would be the organization theDepartment of Defense turned to if that capability were needed in anoperational deployment, she said. ThePentagon previously had referred to these types of platforms as ?nearspace? vehicles, but now refers to them as ?high-altitude? vehicles in aneffort to avoid defining where space begins, Tuttle said. The Arizonaunit is currently working with a system called Combat SkySat, which is built bySpace Data Corp. of Chandler, Ariz. Jerry Quenneville, Space Data Corp. vicepresident for government programs business development, said that the vehicleoperates at an altitude of roughly 65,616 feet (20,000 meters) to nearly101,706 feet (31,000 meters). Space Data Corp. currently markets its servicescommercially to relay information from oil fields. The AirForce awarded an indefinite delivery/indefinite quantity contract to Space DataCorp. in August 2006 with a total possible value of $49 million. Quennevillesaid the company has booked roughly $6 million in orders so far under thatcontract. Eachvehicle costs about $10,000, though the price could be driven down over timethrough larger production runs, Quenneville said. While the company leasesservices to the oil industry, it sells the hardware to the Pentagon, he said. CombatSkySat, which features a disposable balloon and UHF communications payload,could be used today to set up an emergency communications network in a domesticdisaster response operation, Tuttle said. If the Pentagon chose to deploy thesystem as part of military operations overseas, it would likely need severalmonths to purchase a stockpile of platforms to maintain operations over anextended period, she said. Followingthe June exercise, members of the California and Hawaii guard units thatparticipated expressed interest in having their own high-altitude platforms,Tuttle said. A militaryunit would need two or three troops to launch the balloons, and three more tooperate and maintain the high-altitude vehicles, Tuttle said. If other militaryunits are going to begin using the vehicles, they will need to find theadditional manpower to handle the task because it requires dedicated personnel,she said. CombatSkySat is capable of connecting users with handheld communications devicesspread out over an area with a radius of about 298 miles (480 kilometers),Tuttle said. The system could be useful for troops operating in an urbansetting or mountainous terrain who would not normally be able to accessline-of-sight communications signals, she said. The systemcould be particularly useful to special operations personnel because it uses alow power signal that does not require troops to carry a lot of heavybatteries, Tuttle said. The focus of the Combat SkySat experimentation to datehas been on communications missions, but the balloon also could be used as aplatform for surveillance payloads, she added. WhileCombat SkySat is the only high-altitude balloon ready for disaster responseoperations inside the United States today, and overseas deployments within amatter of months, other concepts on the horizon include a vehicle built by NearSpace Corp. of Tillamook, Oregon, that offers users the ability to safelyreturn payloads to troops on the ground. That capability could be particularlyattractive to the military if it opts to deploy classified payloads onhigh-altitude platforms, as those payloads cannot be abandoned, Tuttle said. Quennevillesaid Space Data Corp. has sold training versions of Combat SkySat to the AirForce that feature beacons to assist with recovery, but said that theoperational versions that it has built so far for the military have not beendesigned to be recovered. Near SpaceCorp., which was formerly known as GSSL Inc., has been focused to date onworking with civil agencies like NASA, where it developed its technology whileworking on various potentialMars exploration vehicles, according to Tim Lachenmeier, Near Space Corp.president. Lachenmeiersaid in a July 9 interview that the company received an Air Force contract thatran from April 2005 through March 2006 worth several million dollars thatcovered a feasibility study and a demonstration of the launch of its vehicle,operation of a communications payload, and the return of the payload at theYakima Training Center, a U.S. Army facility in Yakima, Washington. Near SpaceCorp. received a follow-on contract worth around $1 million from the Air Forcein June that runs through the end of 2007 to improve the robustness andsimplify the operations of the vehicle, he said. The companycould have a Near Space Shuttle System geared towards the needs of militaryusers within a year to 18 months, Lachenmeier said. Such tactical users requirethe ability to launch in conditions with significant wind. Near Space couldsupply that capability if the company receives a follow-on contract from theDefense Department with a value of $10 million or less, he said. If it istapped to deliver operational vehicles to the military, Near Space likely wouldpartner with a company that would serve as an integrator for the vehicle?spayload and connect the system with the Pentagon?s information networks,Lachenmeier said. Near Space currently is talking with General DynamicsAdvanced Information Systems about serving in that role, he said. In additionto the return capability, the Near Space vehicle could carry much more capablepayloads than Combat SkySat. Tuttle said Combat SkySat carries payloadsweighing less than 3 kilograms, and Lachenmeier said his company?s vehiclecould be able to carry more than 45 kilograms. Lachenmeiersaid the Near Space Shuttle System could play an important role in supplyingcommunications to bandwidth-consuming unmannedaerial vehicles that the Pentagon is deploying in increasing numbers.